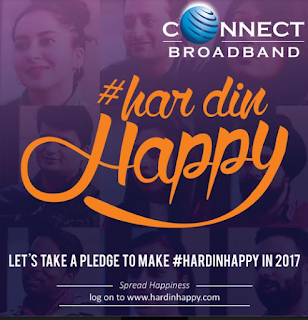 Chandigarh, December 30, 2016: With New Year around the corner, Connect Broadband, market leader in broadband and wire line segment has launched a campaign titled ‘Har Din Happy’. The campaign focuses on engaging people through social media channels and encourages them to remain happy every day. A website, www.hardinhappy.com has been launched where people can visit and take a pledge to remain happy throughout the year. The website measures your happiness quotient. All you have to do is to answer some questions pertaining to different aspects of life and your happiness score pops up. Each user will get a customized E-certificate as an acknowledgement of the pledge taken. Users can share the certificates online on social networking channels such as Facebook, or Twitter and can also encourage their friends and relatives to participate and take a pledge. There is an ocean of studies and research that assert that a happy person is likely to live longer and yet people keep looking for excuses to remain unhappy. The trend is found predominantly in the youth of the nation. Thus the initiative has been taken to emphasize the significance and reimbursement of being happy. The teleco has made a special video called ‘Har Din Happy’ to convey the message that if we decide to be happy we will be happy. The video further brings out the message that ‘life ka hardin happy hona chahiye’. The tide will never be in your favor, but the vigor is in turning it in the direction of your liking. The ‘Har Din Happy’ Video is available on Facebook and You Tube Channels of Connect Broadband. The campaign has been conceptualized and developed by Connect Worldwide, digital arm of the Videocon group.